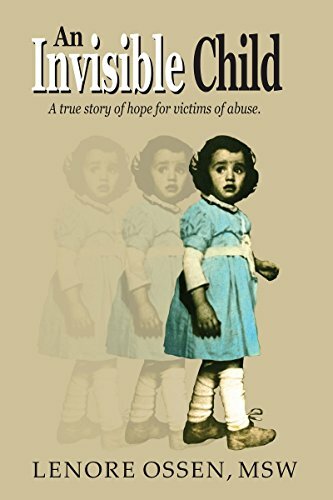 An Invisible Child is a memoir of your life growing up with an abusive mother. Why was this an important book for you to write? I have an unusual story to tell. It is a true story. It is a story about pain, despair, and a struggle to survive. It is my story. I grew up invisible. I was unloved, abused, and shut away from the outside world. There was no school for me, no classmates, no friendships with other children. Under my psychotic mother’s rules I was not even allowed to be touched or speak to family members. I was my mother’s prisoner, and I lived in panic and fear. Later, when I left my mother’s asylum I found it very difficult to function in the world. I started to write my story for myself, with a need to release my pent-up feelings by writing about them. In the process, I was able to free myself of some of the unbearable pain I experienced in childhood. I soon realized what a compelling story I had to tell. So I decided to put it out into the Universe with a hope that others might learn from what I went through and be able to overcome as I have. Writing this book has also helped me to find my own voice. The book recounts many memories that were sad and sometimes unbelievable. What served as a guide for you while writing your story? My feelings and memories were my guide, plus a file my uncle kept on me when I was growing up. My uncle was persona non grata and was not allowed into my mother’s apartment. But he was collecting information from my grandmother and father about the abnormal isolated life I was living with my mother. As I went through the file I found all kinds of information, including a legal document stating that my mother was about to take her life along with mine when I was four. I used the file to write about all sorts of hidden details of my childhood that I never knew about. Writing a memoir causes one to look back at their life in a different lens. Writing a memoir causes one to look back on their life in a different lens. Is there anything you see differently now that you wrote this book? Yes, I am now much more aware of how horrible my life was when I was growing up, I just didn’t want to see it. I didn’t want to deal with the reality of it. Now that I have been able to confront my past, I have been able to feel my feelings, cry my tears, and finally accept my childhood for what it was — and go on from there. I am no longer terrorized by my mother’s demons, and her voice in my head has been replaced by my own. I revised my book several times, and each time I have come closer to the truth of who I really am. The story ultimately serves as a message of hope. What do you hope readers take away from the book? I do hope my book will be helpful to those of you who feel lost and alone in a world that can be cold, cruel, and indifferent. What I want to convey to my readers, more than anything else, is a feeling of hope. One can suffer, the human spirit can be crushed and one can plummet into an abyss, but one can rise above despair. I know – because I have, as I went from one crisis to another, learning and growing emotionally, overcoming the pain that dominated my life. By persisting and not giving up, one can eventually succeed and make a life that is fulfilling, with pleasures and joys from just being alive. Trapped in the twisted world of a psychotic mother, Lenore Ossen is shut away from the outside world. For her, there is no school. No classmates. No friendships with other children. Under her mother’s insane rules, she can’t even turn to family members for solace, and so, day after day, she lives in panic and fear. How can she survive such terrible treatment? In deep despair, Lenore learns to retreat to the safety of her own mind. There she creates a world of fantasy and yearns for someone to take her away from her deranged mother. But there is no one. Most people suffering such abuse would go out of their minds. What makes Lenore different? How does she endure? What drives her to rise above her traumatic past? In this compelling true story, Lenore Ossen describes what living in isolation with a psychotic mother feels like to an innocent child. In telling how she broke free of the nightmare enslaving her, she reaches out to give hope and comfort to other victims of abuse.